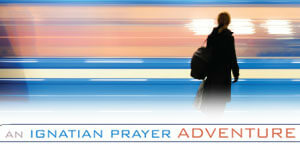 The video and prayer for the First Week of Advent, Cycle C, is based on Luke 21:25–28, 34–36. The art is Wassily Kandinsky’s The Last Judgment. Imagine that you are lifted into the earth’s atmosphere, high enough that you can sense events and emotions from all over the world. Suspended there, you become aware of conflicts all around—wars, disasters, families coming apart, people despairing. This information comes to you in waves of color, brilliant and dark and troubling. As these pigmented mists move around you and as you move through them, you can feel them add weight to your body and soul. You feel yourself take on the sorrow, grief, rage, and confusion caused by sin in the world. You carry the hopelessness that numbs and paralyzes. You drift through the sky, growing heavier and groggier, as if the world’s woes have taken your voice and your ability to think or act. After a while, a clear tone cuts through the murky atmosphere. It is bright and high and yet deep and beautiful—like a trumpet blasting multiple notes at once. A light accompanies the sound, and you can feel the dark masses of sorrow melting away as it approaches. Your eyes and ears seem to open, and you recover the sensation of being yourself, with the ability to hope and to make choices. The heaviness you had collected from the world’s sin sifts away, leaving you light and full of clean, new breath. Then you recognize the One who has come with the light, the One whose light it is. He is speaking to the skies and to the world, proclaiming awful truths, naming all the damage—the death and disease, the abuse and waste. He speaks sharply of how the world is, and you weep to hear this truth. You weep to mourn all those who have suffered in every time and place. You weep out of relief that Jesus, Son of God, has confirmed all the trouble and anguish you have felt. Your own pain is real. You have suffered, too. He proclaims this truth without hesitation. Then his words change, and the brightness grows. Now he speaks of mercy, forgiveness, and restoration. He speaks words to heal. His voice sends waves of fresh air across skies and seas, and you can feel humanity and all creation respond with lifted faces, open hearts. Even the most sin-sick discover hope. Even the most desolate begin to dream new, fantastic dreams. Now, you descend back into your ordinary life. You have witnessed the great judgment, and you find that you are free—free to be healed, and hungry to heal others. thank you for the reflection / meditation piece. Just the right length for me . I tried to read it slowly twice to give me time to listen to the message. Your meditation is a wonderful reminder to express compassion and overcome fear in these days of trouble in our world. If I can focus on the light of Christ, I can lift myself up in His arms and with His armor to live in service and charity. Overcoming fear to reach out in love and to spread hope in this world is the only true path to peace. Christ is the one guide I can trust on this journey.